I had never even considered cooking chickpeas myself. I always used the canned variety. Then I read the Urban Food Producer’s description of how Patricia Wells suggests cooking chickpeas in Salad as a Meal and I knew I had to try it. The first step was finding dried chickpeas. I only had to visit three grocery stores. A couple of nights ago, I decided I’d make home-cooked chickpeas and add them to Patricia’s recipe for Greek Salad, sort of a two-for-one dinner special. Then I actually read the recipe. “Set aside at room temperature for 12 to 24 hours…” So I delayed my feast by a day. Cooking the chickpeas was a cinch – I combined olive oil, onions, garlic and a dash of salt in a large pot, then added the chickpeas, chicken stock and some fresh herbs. Everything simmered for about an hour and a half. I can’t tell you how good the house smelled while the chickpeas were cooking. “I don’t know what you’re making, but I want some,” said the Grillmaster. Once the chickpeas were tender, I pulled some out of the pot and put them in the refrigerator to cool off while I chopped everything for the Greek Salad. Into a bowl went lemon juice, salt, olive oil, fresh oregano, tomatoes, cucumbers and Kalamata olives. I let this mixture marinate for about 15 minutes, then I added the chickpeas and feta cheese. The salad was nice and crunchy, but the tomatoes I used were pretty flavorless. In the middle of the summer, with some fresh, local heirloom tomatoes, this salad would be amazing. Whenever I’ve eaten chickpeas before, I’ve never gotten very excited. The home-cooked chickpeas were creamy and delicious. I won’t say I’ll never use canned chickpeas again, but it won’t be often. The Home-Cooked Chickpeas are low in Cholesterol and a good source of Fiber. 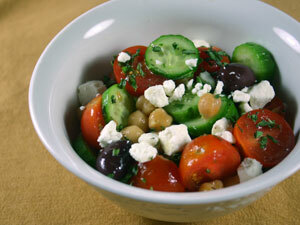 The Greek Salad is high in Saturated Fat and Sodium primarily due to the feta cheese. I used about half of the amount that the recipe called for to make the meal even healthier. The nutritional information below is for the recipe as published in Salad as a Meal. What a valuable post! You really make a difference! Looks so good! Great post. I can’t wait until summer, when we will have tomatoes, cucumbers, and sweet onions fresh from our gardens and local markets. Seriously drooling looking at your pic. I’ve been adding the chickpeas I made to everything for weeks now. All sorts of green salads, and I also made hummus. Delicious. Thanks again for the nutritional info. LOVE that you do that. I am a big fan of hummus, and when chickpeas (garbanzos) are on the salad bar I always throw a few on salad. It’s funny we both are having chickpea adventures this week….my canned chickpeas exploding in the microwave. Giggles Too bad dried chickpeas are so hard to find when you live in a rural area. I am off to the big city! Yum!! I’ve never thought to cook chickpeas either! I’m wondering if they carry any at Village Grocery? Thanks for the post!! Another winner! I am loving this Salad as a Meal idea!